Could your DNA make it harder to wake up early? Brightening an otherwise dark room, the numbers on the alarm clock glow with a steady message: Time to wake up. The bed is cozy, though, and the day promises to be a busy one. It’s moments like this where getting up in the morning isn’t so easy. It’s not an uncommon experience, but for some people, waking up in the morning can be a unique challenge. There are many reasons for this, one of which may have to do with the HCRTR2 gene. We usually don’t give it much thought, but being awake is not a simple thing—it’s a very active process. In the awake state, our brain has to process incoming sensory information, coordinate body movement, recall memories, and formulate new thoughts. In contrast, while sleeping, our bodies become temporarily paralyzed, we become less aware of external stimuli, and our brains’ focus turns inward1,2. Both states of being—awake and asleep—are actively promoted by processes in our body, in the same way that we have to actively turn and hold the steering wheel of a car to make it move in one direction or another. In order to stay awake, our bodies rely heavily on the orexin signaling cascade3. The orexin signaling cascade is a process that allows our bodies to promote, and stabilize, a state of wakefulness. It all starts with a protein called orexin (sometimes also referred to as hypocretin). Orexin is a neurotransmitter, which means it helps neurons communicate. Specifically, orexin helps neurons in the hypothalamus communicate with special neurons located throughout the central nervous system3. Our brain is a complex network of specialized neurons that are extremely interconnected. Stimulation of one neuron can lead to a chain reaction where several of the connected neurons also become stimulated. Its through interconnected pathways like this that our brain is able to send out different messages to the body—messages like “stay awake,” “stay alert,” and “keep muscle tone.” Orexin is known to stimulate a network of neurons whose jobs include waking us up and keeping us awake. In order for these neurons to detect orexin, they use the HCRTR2 gene3. MySleepInsights by MyVytalics provides information about multiple variants in the DNA with potential links to sleep—including a variant in the HCRTR2 gene. The evidence linking these variants to sleep is still very new and requires more studies to confirm their association with sleep traits. With MyVytalics, you have the ability to contribute valuable information towards this effort. By opting into an insight development part of the app, known as MyJourney, you can help MyVytalics develop new insights into how this variant contributes to our wakefulness. HCRTR2 is a segment of DNA that codes for the Orexin receptor-2 protein (OX2R). Orexin interacts with the OX2R protein in specific neurons, which causes a series of downstream reactions within the neuron—ultimately leading to an electrical pulse that stimulates wakefulness1,3. With such an important role in keeping us awake, it’s not surprising that changes in the orexin signaling cascade can lead to changes in our sleep patterns, daytime alertness, and whether we feel like getting up in the morning. Recently, researchers identified a potential link between changes in the DNA coding for HCRTR2 and how a person feels about getting up in the morning4. Scientists asked hundreds of thousands of people to rate how easy it is for them to get up in the morning and compared their answers to their DNA sequences. From this analysis, they found that people with a variant—a change in the DNA sequence—in the HCRTR2 gene were more likely to report that they had difficulty getting up in the morning. This finding is still very new, and will need to be confirmed in follow up studies. However, given HCRTR2’s role in keeping us awake, it’s possible that this variant disrupts orexin signaling and makes it harder for people to transition from a sleep state to wakefulness. Research into the genetics behind sleep has advanced to the point where it’s now possible to sequence an individual’s DNA to learn about their potential sleep habits. Scientists have identified a number of other variants in the DNA that may affect how long we sleep, when we sleep, whether we snore when we sleep, and conditions like insomnia. It’s also possible for you to take advantage of this research and analyze your own DNA for these variants. 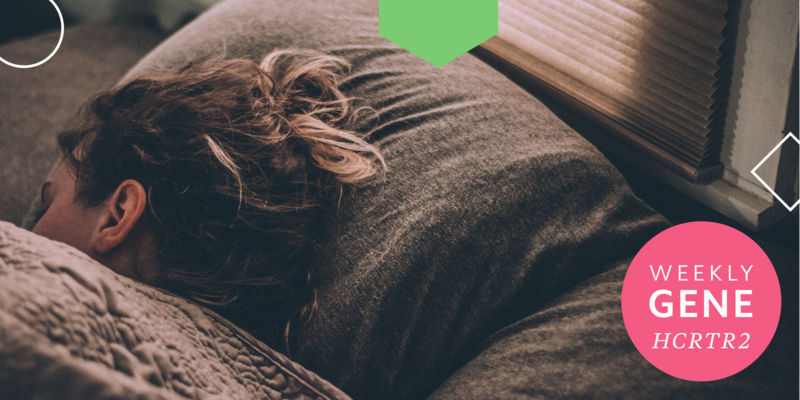 MySleepInsights by MyVytalics, available in the Helix Store, gives you the chance to learn about your DNA sequence and how it may be impacting your sleep. This product tests for all of these traits, including the ease of getting up based on the HCRTR2 gene, and provides you with information about each. 1Sehgal, Amita, and Emmanuel Mignot. “Genetics of Sleep and Sleep Disorders.” Cell 146.2 (2011): 194–207. PMC. Web. 10 Sept. 2018. 2Wright, Kenneth P., Christopher A. Lowry, and Monique K. LeBourgeois. “Circadian and Wakefulness-Sleep Modulation of Cognition in Humans.” Frontiers in Molecular Neuroscience 5 (2012): 50. PMC. Web. 10 Sept. 2018. 3Leonard, C S, and J P Kukkonen. “Orexin/hypocretin Receptor Signalling: A Functional Perspective.” British Journal of Pharmacology 171.2 (2014): 294–313. PMC. Web. 12 Sept. 2018. 4Jansen, Philip R, et al. “Genome-Wide Analysis of Insomnia (N=1,331,010) Identifies Novel Loci and Functional Pathways.” BioRxiv, Cold Spring Harbor Laboratory, 1 Jan. 2018, www.biorxiv.org/content/early/2018/02/01/214973.